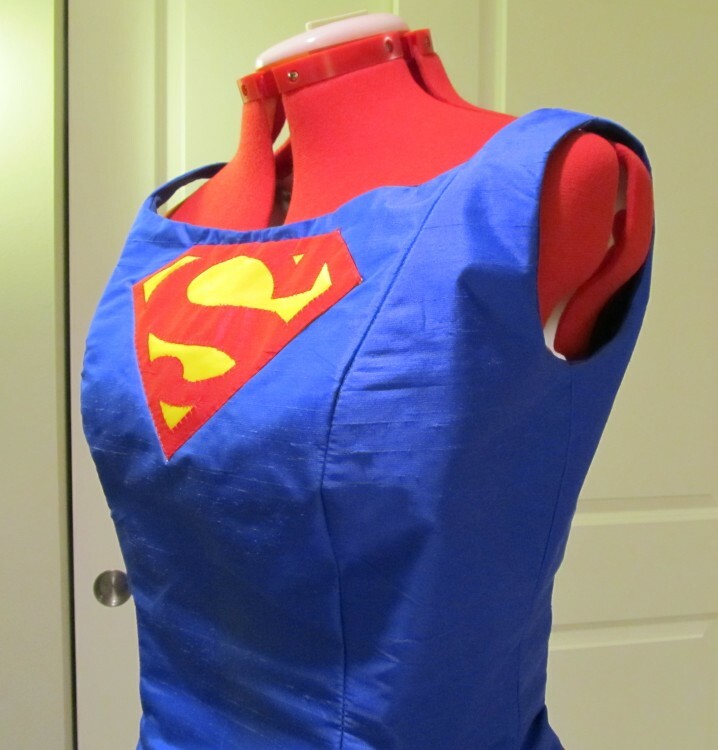 I finished the bodice for my new costume. 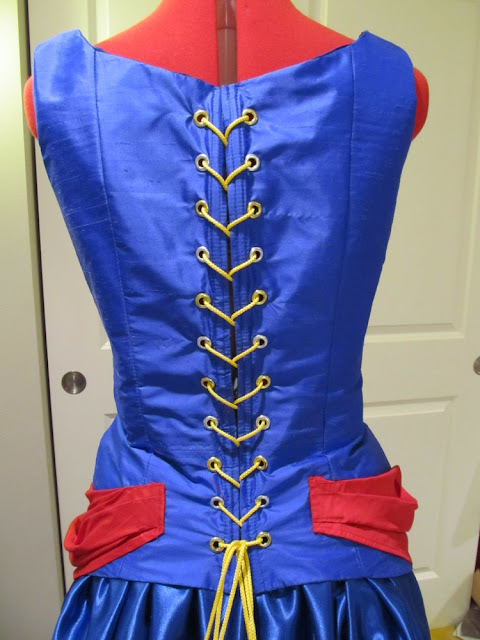 It is made of blue dupioni silk, with boning in the lining, and lacing up the back. Grommets alternate gold and silver. I originally planned to use all gold but I had one box of gold and one box of silver, so this is what happened. Figured out what I'm making yet? This is going to be a steampunk/fantasy/Victorian Superman costume. 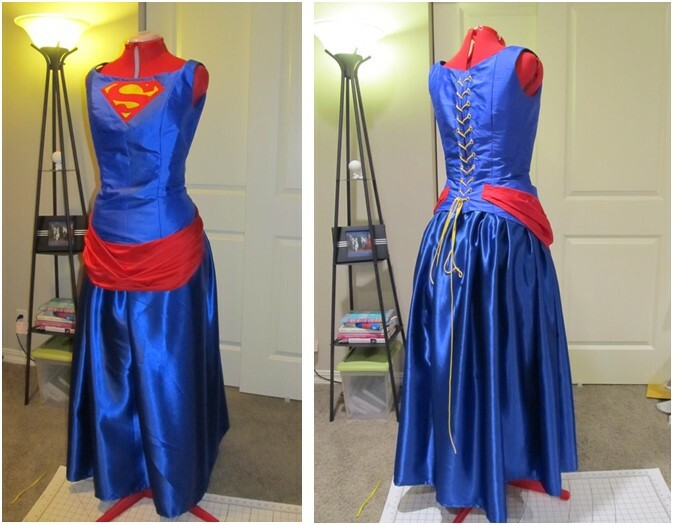 Like, if Superman was a woman and lived in the age of steam engines, bustles and top hats. I'm killing two chickadees with one stone here; this costume will be great for both Comic-Con and SteamCon! Especially when I hook up with the rest of the DC Justice League at Emerald City Comic Con this weekend. The pattern I used for the bodice is modified from Butterick 3012. 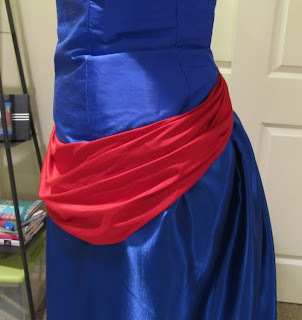 I only used the bodice and the drape, not the skirt part of the pattern. I added two inches of height at the waist and raised the neckline so I could fit the logo on the front. I later discovered I really did not need to make the torso 2 inches longer like I do with Simplicity patterns, since this bodice already has a low waist. Shown with a blue costume-satin skirt (this is not the final skirt for this costume, it will be shorter and bustled.) Those lacings need trimming! 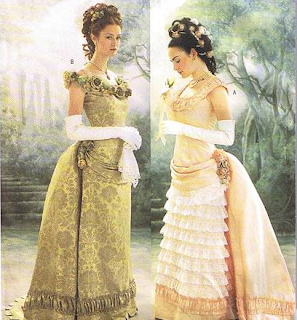 The drape is sewn onto the bodice, following the instructions in the pattern. I used red dupioni silk, the same fabric I used in the "S" logo.